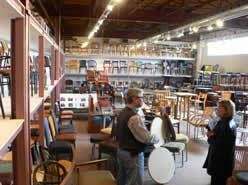 extensive line of chairs and stools. Small shop owners don’t realize the tremendous payback they can enjoy by adding a paint line conveyor to their operation. This intrigued me. Many small shop owners were clearly unaware of the cost of our monorail conveyor systems and were quick to jump to the conclusion that any conveyor equipment was prohibitively expensive. I changed my approach on the second day of the show, immediately discussing with visitors the cost of a 100 foot and 200 foot system. That changed everything. They stayed longer and they came back later in the show for a second look. PACLINE has worked with several small wood shops. To show you how automation might benefit your operation I would like to share with you the recent experience of one of our customers – Contract Supply Inc.
air space to speed up drying time. 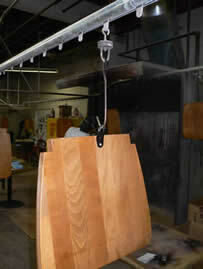 Contract Supply (CS) manufactures chairs and tables primarily for the restaurant and hotel industry. 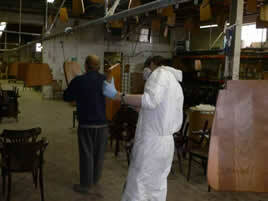 They also handle large volume refurbishing and refinishing of chairs and tables. This company was at a stage where they needed to take on larger orders with inherently lower margins. Because of the low margins, CS needed to be highly efficient with production costs, and with the larger size orders they could not afford any rework. One problem, and he would be ‘in the red’. CS normally processed chairs in batches, and they needed to maintain this ability. The paint room floor was already filled to capacity with carts so, potentially, CS would need to expand their space to accommodate the higher volume. They considered a floor towline with ovens for shorter cure times, but the cost was in the $400,000 range. In addition, there would be the added expense of natural gas to fire the oven, and various permits would have to be secured to carry out the work. PACLINE came forward with a very different approach. Our goal was to use the existing space and equipment at CS but connect the processes into an “assembly line”. This was all made possible by developing a wood finishing conveyor system that utilized the unused ceiling area of the existing facility. Using this overhead space where it was naturally warmer also aided in the drying process. An overhead chain conveyor is absolutely the most flexible conveyor available. With only one drive, it can snake around obstacles and incline and decline in very short distances. 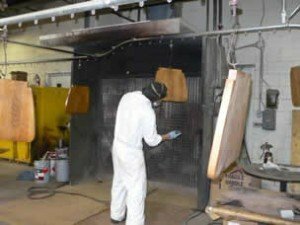 Our conveyor was able to move items at Contract Supply through the paint spray booth, incline to the ceiling where it wound back and forth to allow the precise drying time required, and then moved down to the floor for approximately 20 feet of sanding. The conveyor was set approximately 7 feet from the floor to allow workers and batch carts to pass beneath, and the hooks were made to a length that would allow for good operator ergonomics. The conveyor was designed to route through the three existing booths: stain, lacquer and sealer. Within each booth, the conveyor made an elevation change to allow the operator to reach both the top and bottom of the chair parts. PACLINE supplied a rotator for each hook and the operator turned the parts as he desired without physically touching the parts. wood part to allow handling on conveyor. But that was not all. CS management was pleasantly surprised to discover that the new assembly line helped ensure that their people worked at a much more consistent and sustained speed. Workers no longer had to walk to get carts. The product now came to the workers at a rate of production set by the manager. 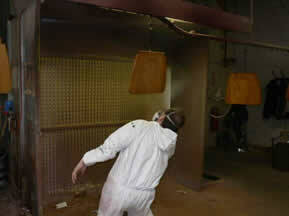 When product entered the spray booth, the worker had to be there and ready. Overall productivity increased substantially. Despite some initial reluctance to operate on an ‘assembly line’, workers at CS soon realized how the automated finishing line made their job easier. access to all sides of parts.